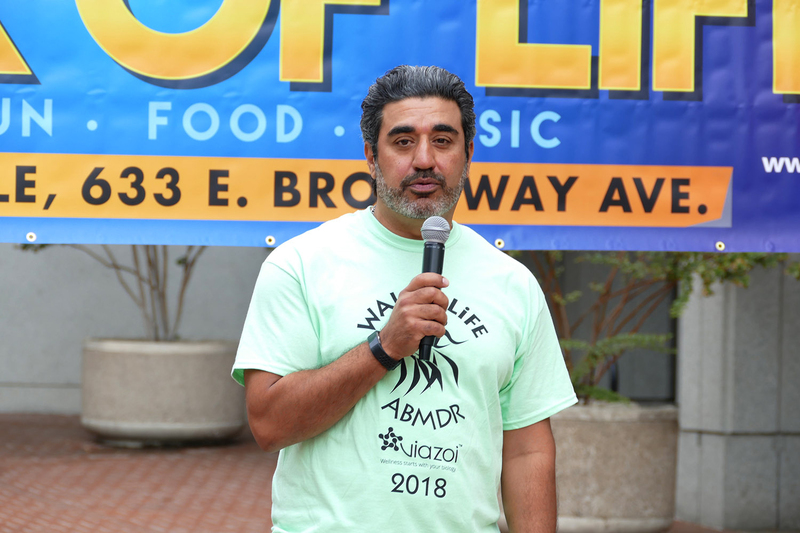 Los Angeles, October 8, 2018 – The 13th annual Walk of Life, held on October 6 in Glendale, drew strong community support, particularly from among the ranks of the youth. 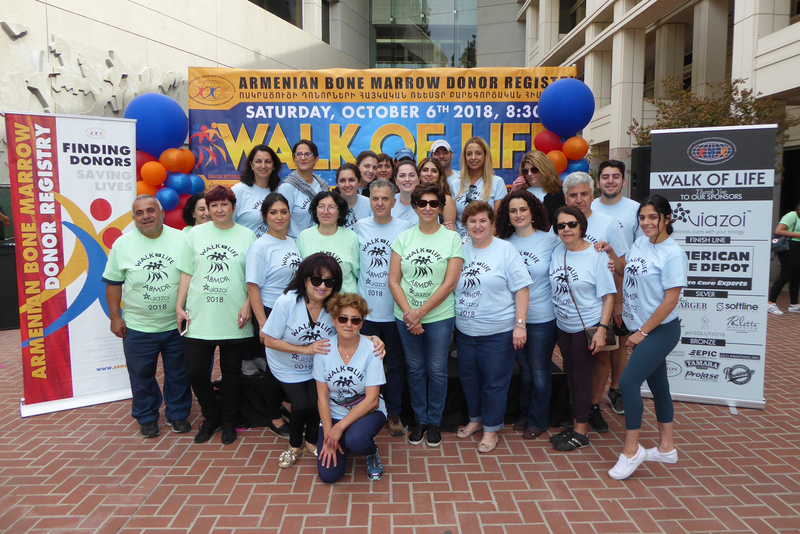 Close to 300 people participated in the event to walk and raise funds for the life-saving mission of the Armenian Bone Marrow Donor Registry (ABMDR), in a festive atmosphere that featured music and food. Walkathon participants included state and local elected officials and community leaders, and numerous teams representing schools, universities, community organizations, and individual supporters. 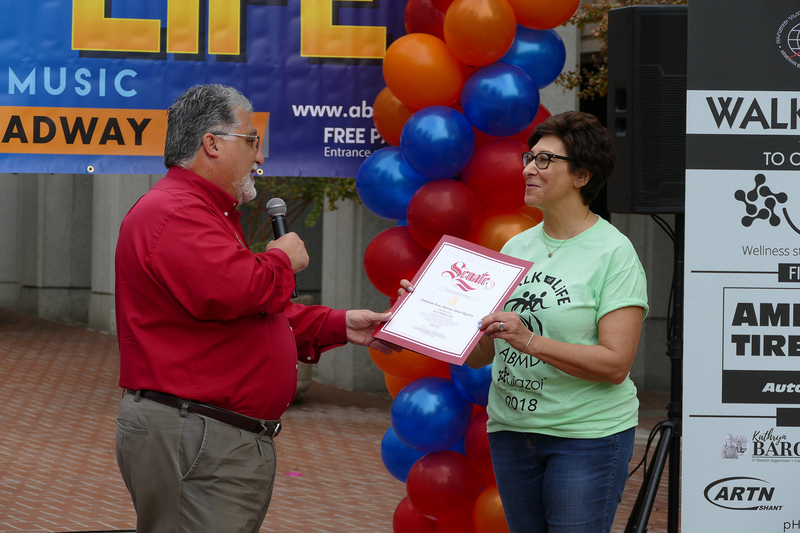 Walk of Life’s opening ceremony took place at the plaza of the Glendale City building. 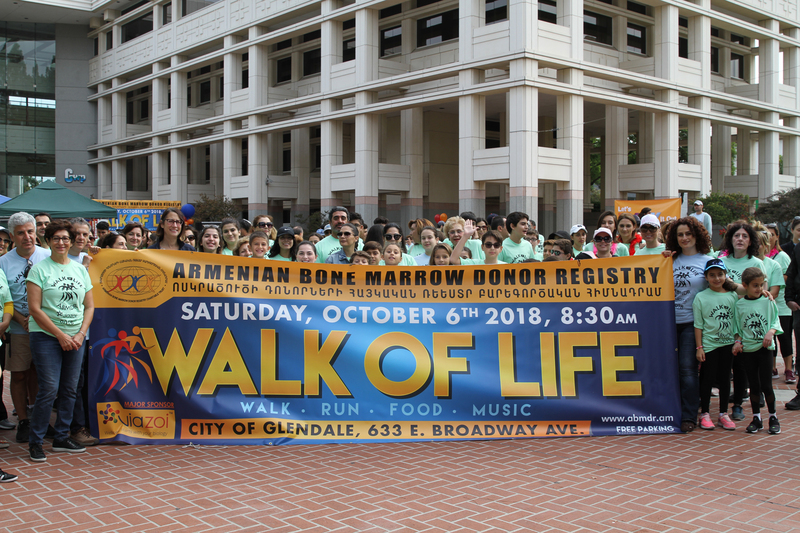 In her opening remarks, Walkathon Committee Chair Dr. Christina Ashjian said, “It’s due to fundraisers like this that we are able to move forward with the ABMDR mission to find donors for patients in need of a bone marrow transplant. To date, this organization, which is run entirely by volunteers, has registered over 29,000 donors from 29 countries, and facilitated 31 transplants. As importantly, ABMDR has established and operates a world-class tissue-typing laboratory and a state-of-the-art stem cell harvesting center in Yerevan. All of these achievements are made possible by you, our supporters.” Dr. Ashjian thanked the walkathon’s major sponsor, the Viazoi company, as well as other top sponsors including American Tire Depot, Los Angeles County Supervisor Kathryn Barger, Softline Solutions, ARTN-Shant TV, Paulette Malekian of Dilbeck Real Estate, P.H. Solutions, Dr. Peter H. Ashjian, Epic Auto Leasing and Sales, Alco Printing, Porto’s Bakery & Café, Tamara Ice Cream, Prolase, and Providence High School. 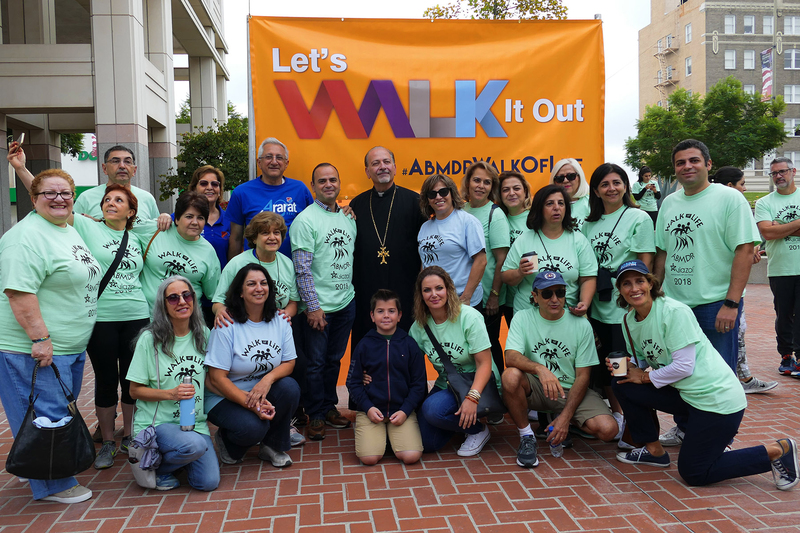 Dr. Ashjian also acknowledged attending dignitaries and Walk of Life’s honorary chairs, including Father Vazken Atmajian of the Western Prelacy; Father Hovsep Hagopian of the Western Diocese; California State Senator Anthony Portantino; Talin Mangioglu, District Director for Senator Portantino; Mary Hovagimian, representing US Congressman Adam Schiff; California State Assembly member Laura Friedman; Glendale Mayor Zareh Sinanyan; Glendale Unified School District Board of Education members Dr. Armina Gharpetian and Shant Sahakian; and Areg Boyamyan, Senior Vice President of Foundation Laboratory and an executive with the Viazoi company. Next, Dr. Jordan invited State Assembly member and longtime ABMDR supporter Laura Friedman to address the participants. “I’ve been attending Walk of Life for many years, and it’s wonderful to see it grow,” Friedman said. “This is a truly extraordinary event, organized by a truly extraordinary organization, through which you can literally save a life, if you’re lucky enough to be a match for a patient in need of a transplant. This is a very personal event for me because I’m a cancer survivor. 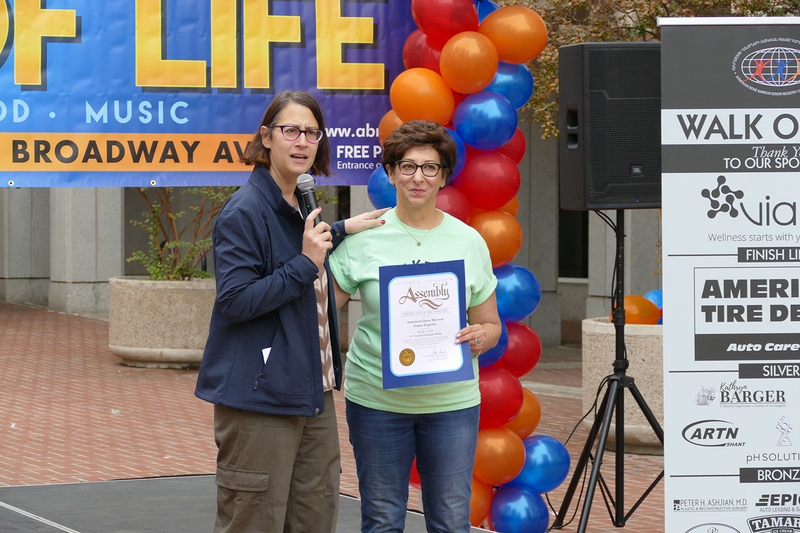 We will be walking today for all the Armenian and non-Armenian patients who might find a bone marrow match because of your efforts, because of your donations of time and money.” Subsequently Friedman presented Dr. Jordan with a Certificate of Recognition, issued by the California State Assembly in honor of Walk of Life. Also delivering remarks was Arpine Zohrabyan. “Seven years ago, I received a phone call that changed my life,” she said. “I was identified as a bone marrow match for a three-year-old child who had been given three-to-six months to live. With the bone marrow stem cells I was able to donate, she received a transplant, and today she’s ten years old and cancer-free. It’s thanks to organizations like ABMDR that such life-saving procedures are made possible, and I encourage every one of you to support the Registry’s mission, so that you, too, might experience the deeply rewarding opportunity to help save someone’s life.” The event’s last speaker was Senator Anthony Portantino. “I am delighted to be here today and as ever proud to be a supporter of ABMDR,” the Senator said. He went on to present Dr. Jordan with a Certificate of Recognition from the California State Senate, in honor of the walkathon. Following the ribbon-cutting ceremony, the 5-K walk-run looped through central Glendale. 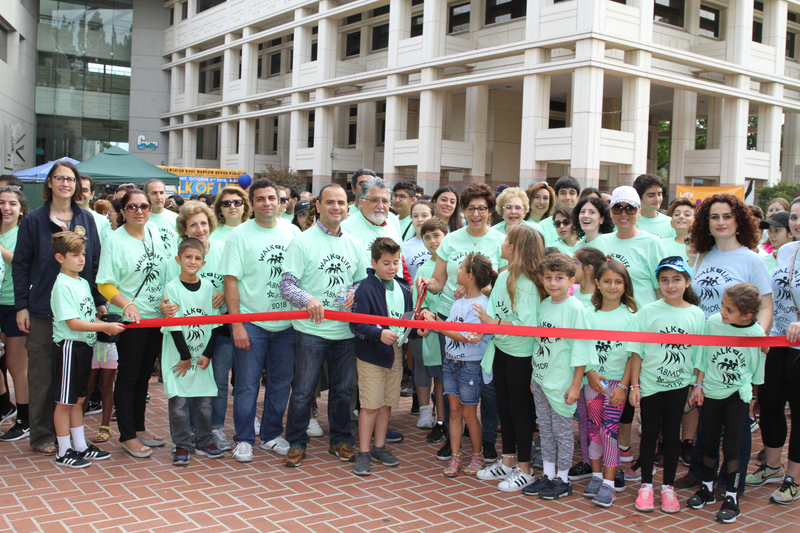 The walkathon concluded at the plaza of the Glendale City building, where the festivities continued into the day. The event also gave participants the opportunity to join the ranks of ABMDR as potential bone marrow stem cell donors, as many volunteers were on hand to answer questions and welcome new recruits.